Immediately striking in appearance thanks to a plumb bow design, the first hull of the Horizon V68 was extremely well received during her West Coast debut at the Newport Boat Show in April 2018. Large open spaces, wide side decks and a voluminous interior that takes advantage of a 19’6” beam — along with large windows throughout the main deck and cabins — invited onlookers to step aboard and stay for closer inspection. With anticipation from the market mounting, the Horizon V68 Hull Two has now launched and is being prepared to showcase at the 2019 Seattle Boat Show. Intended as a large, long-range yacht fitted with superyacht amenities, the Horizon V68 was created in collaboration with world-renowned designer Jonathan Quinn Barnett (JQB). 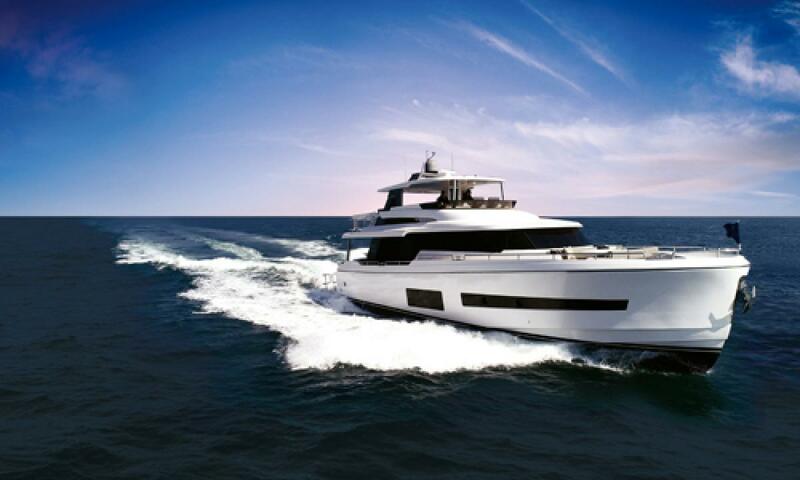 Stimson Yachts of New Zealand designed the hull, which features a unique vertical bow that affords a generous beam and reduces drag at lower, displacement speeds. Optimized by a shallow 5’-7 1/2” draft and powered by twin Caterpillar C18 ACERTs of 1,136 bhp each, the V68 reaches a top speed of 25 knots. The larger hull beam not only makes for greater stability and increased interior spaces, but also provides a superior cruising experience. Customization is a special feature of the V68, and owners are given the choice of at least two major layout options for each deck. With regards to accommodations, the V68 offers a three or four-cabin layout with a private and spacious master suite located midship. Outfitted in dark walnut wood accented by light neutrals, the stylish interior of V68 hull two lends a sense of elegance and comfort. The master stateroom is truly a luxurious retreat, featuring a king-size bed, a well-planned ensuite fitted in Statuario Venato marble features separate toilet and shower areas as well as floating cabinets with dual basins, and is hidden behind a sliding door that features electric polyvision glass– with the touch of a button, this glass goes from clear to frosted. A walk-in closet to starboard and plenty of storage further augment this space. Optional quarters for crew are situated aft. On the main deck, the design emphasizes unobstructed views to enhance the feeling of spaciousness with an open salon that flows into a large joined galley and country kitchen; the main deck can also be configured with a country kitchen or lower helm forward. A long bar is incorporated in the flybridge, and the aft deck hosts a mini bar as well.